Some 1.8 million potentially deadly Takata airbags in Australian cars still need replacing, according to the Australian Competition and Consumer Commission (ACCC). On Aug. 2, the ACCC released state-by-state data recall rates of the Takata airbags. The consumer watchdog is reminding drivers and manufacturers to replace the airbags as soon as possible. 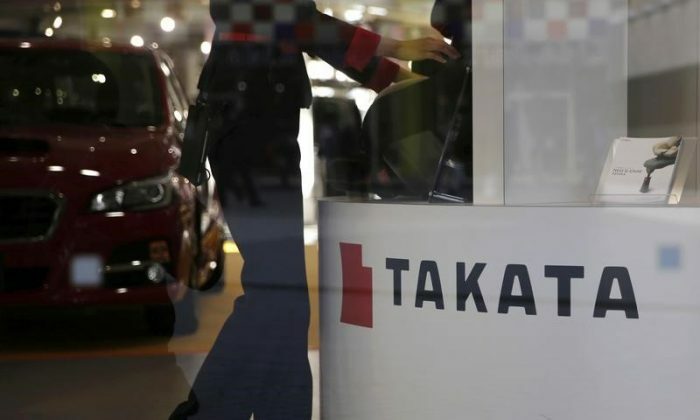 For the first time, manufacturers can also check the progress they have made in replacing the defective Takata airbags, which can explode and potentially kill. It has been one year since the ACCC began to oversee the Takata airbag recall, the largest global vehicle recall in history that has seen millions of Australians affected. They have been linked to at least 24 deaths and more than 300 injuries around the world. 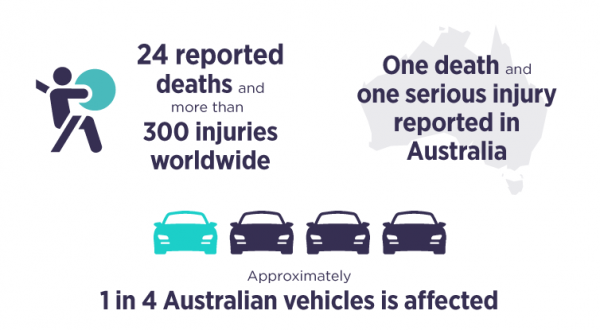 In Australia, a man in New South Wales was killed in July 2017 from a Takata airbag rupture, reported ABC. A woman in the Northern Territory also suffered severe injuries from her airbag after a separate crash in April 2017, reported Fairfax. The ACCC urges drivers of affected cars to have the airbags replaced as soon as possible. “Don’t ignore or delay responding to a letter or call from your car’s manufacturer asking you to have your airbag replaced. The airbags degrade over time and can become lethal by misdeploying and firing metal shards at the car’s occupants,” ACCC Deputy Chair Delia Rickard said, according to a release. Rickard warned about the “alpha” airbags that require urgent replacement because of the dangers associated with the airbags malfunctioning. But the consumer watchdog said potentially 19,500 of such cars may still be on the roads. “Our greatest concern remains around the alpha airbags, which can still be found in almost 20,000 cars. Make no mistake, these airbags can kill and our advice is for consumers to check our website to see if [their] car is affected by this recall. If your car contains an alpha airbag, it should not be driven,” Rickard said. “I encourage everyone who owns a car to visit this site,” Rickard said. Over the past 12 months, the ACCC says 1.1 million airbags have been replaced in some 930,000 vehicles. Following a 2017 ACCC safety investigation of the airbags, Assistant Minister to the Treasurer Michael Sukkar issued a compulsory recall (pdf) on Feb. 27, 2018. 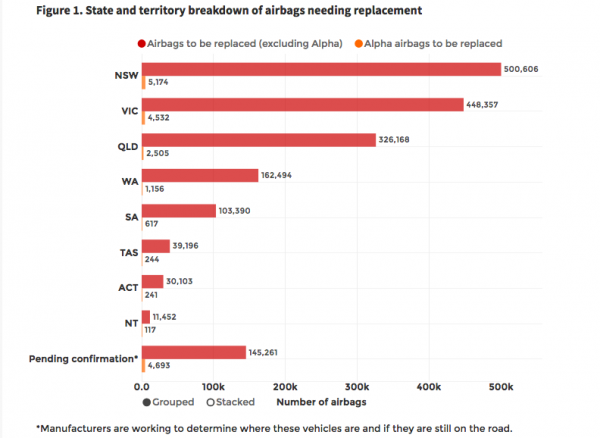 Suppliers need to replace all defective Takata airbags in Australian vehicles by Dec. 31, 2020. The ACCC is publishing recall updates on the Takata recalls progress data page. Certain types of Takata airbags use a chemical compound, called phase-stabilised ammonium nitrate (PSAN), to inflate. A design defect in these airbags causes the chemical compound to degrade when exposed to moisture, and this is more likely as the airbag ages. Due to the degradation, if the airbag is triggered and deployed in a collision, it may inflate with too much force and can shatter the canister that holds it, which is made of metal, and consequently shoot out metal fragments that could hit vehicle occupants—potentially injuring or killing them. The defective airbags had been installed in more than a hundred million cars worldwide.